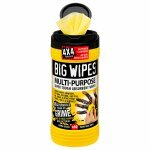 Multi-Purpose Big Wipes for the removal of all types of grime, including: paint, silicone, grease, oil, gap fill & more. Antibacterial & preservative free! The original super tough Big Wipes for general all-round cleaning. 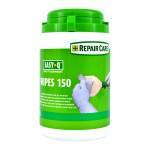 Removes paint, adhesive, PU foam, silicone, gap fill, oil, bitumen and much more. 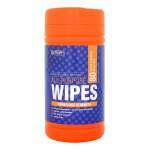 The Multi-Purpose wipes are made from a quilted, 4-layered, power-fabric making them strong, tear resistant and lint free. The powerful 4x4 formula contains 4x Power Cleansers and 4x Skin Conditioners making them tough on muck and grime but kind to hands. 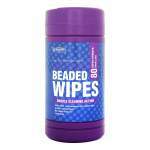 Antibacterial & preservative free! 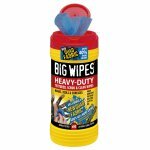 As tough as they come — use them for just about every cleaning task. 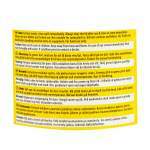 Highly absorbent and no linting. 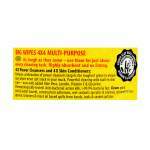 Unique combination of power cleansers targets the toughest grime to ensure our wipes never get stuck in your muck. Powerful cleaning with built-in skin care — now with added Aloe Vera, Lanolin, Vitamin E & Glycerine. Dermatologically tested. Anti-bacterial action kills >99.9% bacteria fast. Cleans paint (oil & water based), construction adhesives, wet sealants (acrylics & silicone), uncured PU foam, grease, bitumen & most oil based spills from hands, tools & sealed surfaces.